Better than white & Brown rice; It's Haiga mai (Haiga-rice)! Better than white & Brown rice; It's Haiga mai(Haiga-rice) ! 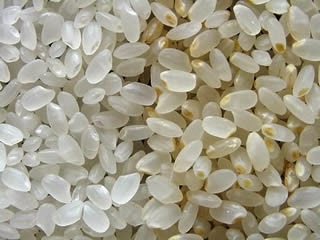 We use Haiga-mai (half-milled rice/haiga-rice) for our onigiri. It's neither brown nor white rice, but somewhere in between the two. It is commonly believed that brown rice provides more nutrition when compared to white rice, but if we consider the amount of nutrition made useful through digestion, this belief may not be entirely true. Brown rice is thought of as very nutritious when compared to white rice, but the benefit is actuary quite limited. "In fact, brown rice, often believed to be the grain's healthiest incarnation, turns out to be the worst option, when it comes to this angiotensin-blocking compound." "White rice cooks for less time, but most of that nutritious inner layer has been polished off to get that light and fluffy texture." Eguchi presents HAIGA-MAI as a third option. The glycemic index of haiga-mai is 70. This falls between rice rice's 88 and brown rice's 55. All three rice options have a lower glycemic index than most types of bread. It was during the Edo era (1603–1868) that the eating of white rice became widespread. It was during this same period that the occurrence of beriberi (a disease caused by thiamine deficiency) amongst wealthy city dwellers who could afford polished white rice became so prevalent that is was commonly referred to as "Edo disease." During the Japanese-Russo War (1904-1905), the Japanese military experienced 80,000 deaths amongst its ranks, 14,000 of these were caused by beriberi. At this time, the cause of the disease was still a mystery. In 1924, Dr. Junjiro Shimazono, a professor at The University of Tokyo, determined that the cause of beriberi is a lack of Vitamin B1, and advocated for the eating of haiga-mai instead of white rice as diet staple. In 1928, a government panel of health experts recommended that a "prohibition of white rice, which has been stripped of its germ" was needed, and this became the origin of widespread Haiga-mai production and consumption in Japan. After World War 2, cheap manmade vitamins were introduced to the market and vitamin enriched white rice overtook haiga-mai's popularity. These days in Japan, haiga-mai has attracted attention as a natural way to obtain better nutrition. 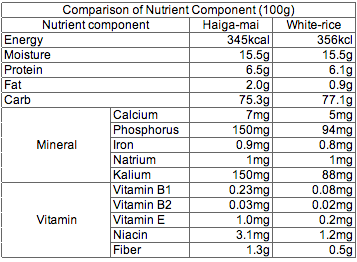 Haiga-mai's benefits are not only nutritional, but in taste and texture too. It isn't as hard as brown rice, and it has richer flavour than white rice. When we started making onigiri in North America, we were determined to use haiga-mai despite it's higher cost and more difficulty in sourcing it. If we were to encourage the eating of rice to consumers who were not accustomed to eating much rice, we were determined to introduce our customers to the rich taste and nutritional benefits of haiga-mai. We hope you enjoy haiga-mai when eating Abokichi onigiri!! Why Are Induction Heating Rice Cookers So Hot?